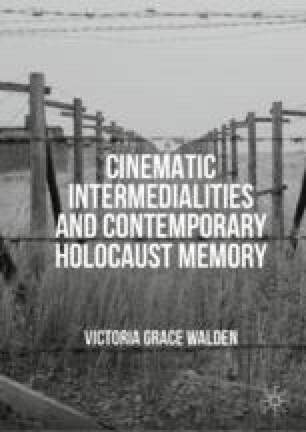 Finally, the book’s brief epilogue examines how some of the philosophical observations made in this book are informing contemporary practices in Holocaust commemoration. I conclude by considering how the ways in which the intermedial works discussed in this book position us in an inbetween space which might be more productive than offering a more simple empathetic relationship with victims. I argue that a liminal position helps the spectator to recognise both their material semblance with Holocaust victims as human beings whilst simultaneously acknowledging their radical experiential differences. Following claims made in earlier chapters, I consider this a particularly productive position that encourages us not only to engage with our imagination, but also to reflect more heavily on how we might avoid becoming bystanders or perpetrators in the future, rather than provoke us to reflect on what it might be like to have violence enacted upon us. After this brief summary of the book’s ideas, I focus on two installations and an augmented reality app recently developed at the Bergen-Belsen Memorial (Gedenkstätte Bergen-Belsen) in Germany to consider how recent developments in screen memory might be moving towards an emphasis of the space inbetween media and bodies, and thus offering more ambiguous spaces in which spectator, visitor or user is invited to critically, imaginatively and bodily contribute to Holocaust memory—to think and feel for themselves, rather than be interpellated into a particular way of remembering this past.